Lock in a great price for Holiday Inn Express Berlin City Centre – rated 8.2 by recent guests! The staff were friendly, helpful, and engaging! 5 star! Breakfast was complete and delicious. The staff was great and I was pleased with their services. Relatively close to the S2 station. Breakfast included was good. I liked that the hotel was close to Martin Grosse Bau Museam and the Hitler Bunker Museum. It was very close to Anhalter Bf station - a 5 minute walk. It was easy to catch the metro/subway. The room was clean, had nice hot water, clean towels, clean sheets, and clean facilities. Lidl was a 2 - 3 minute walk from the hotel. Great location, friendly staff, clean and comfortable rooms. We will definitely stay again next time we're in Berlin. The hotel was clean and comfortable for a two night stay. The location is good,we can go anywhere easily with bus or metro.Close to the Haufbhanhof station,Berlin Bunker Museum, Discovery Legoland,Mall of Berlin,Topography of Terror and Brandenburg tor. The location of the hotel is very good, there is a supermarket near by, the staff are friendly and you can enjoy a good breakfast with everything fresh and good quality. Holiday Inn Express Berlin City Centre This rating is a reflection of how the property compares to the industry standard when it comes to price, facilities and services available. It's based on a self-evaluation by the property. Use this rating to help choose your stay! One of our top picks in Berlin.This 3-star superior hotel offers air-conditioned rooms and excellent public transport links throughout Berlin. The Potsdamer Platz and Checkpoint Charlie are only a 12-minute walk away. The bright and spacious rooms at the Holiday Inn Express Berlin City Center feature a flat-screen satellite TV, tea/coffee facilities, a desk and a modern bathroom. Free WiFi is available throughout the hotel. Guests can use the business center at Holiday Inn Express Berlin City Center. The reception is open 24 hours a day, and can arrange tickets for Berlin’s sights and cultural events. Holiday Inn Express Berlin City Center has an on-site parking garage. It is 1,300 feet from Anhalter Bahnhof S-Bahn Train Station, with good train and bus connections to Berlin Main Station and Friedrichstraße shopping street. 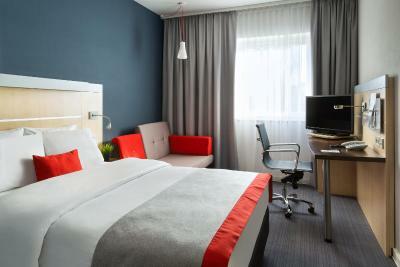 When would you like to stay at Holiday Inn Express Berlin City Centre? This contemporary-style room is soundproofed and air-conditioned. It includes a flat-screen satellite TV, desk, tea/coffee facilities and a bathroom with shower and hairdryer. No extra bed is possible in this room. Baby cot is available upon request. This double room has a electric kettle, air conditioning and satellite TV. It also features a walk-in shower with curtain and extra wide doors and a large bathroom equipped with an emergency alert for disabled guests. An additional guest can sleep on the sofa bed. Baby cot is available upon request. An additional guest can sleep on the folding sofa. Visit Berlin and feel at home in the newly renovated, three star Holiday Inn Express Berlin City Centre Hotel just a few hundred meters from Potsdamer Platz. You can reach the hotel quickly and easily by public transport from both Tegel (TXL) and Schönefeld (SXF) airports, or from the central train station. Check in to our newly renovated, comfortably furnished rooms. You will find rest and relaxation in air conditioned rooms with soundproof windows. High speed wifi internet access is free of charge, as are the coffee and tea making facilities. The brand new box-spring beds with pocket-sprung mattresses ensure a relaxing night's rest. Our breakfast buffet, which is included in the price of every room, means you can start the day feeling fortified. Our non-smoking hotel has 105 parking spaces in the hotel's own underground car park and 1 meeting room with daylight, wifi and direct access to the garden. House Rules Holiday Inn Express Berlin City Centre takes special requests – add in the next step! Holiday Inn Express Berlin City Centre accepts these cards and reserves the right to temporarily hold an amount prior to arrival. The entire hotel is nonsmoking. Please make sure if you need a baby cot to contact the hotel in advance. Air con wasn't switched and our window looked onto the street which was noisy at night in spite being on the 2nd floor. Room clean, lots of choice at breakfast and very pleasant and efficient staff. Bar staff unforgivably slow and unattentive.Just go across the road for a drink it will be much more convenient, cheaper too. Breakfast options are limited. Excellent breakfast. Fast check-in and out. Facili9as advertised. Outstanding location. Lots of wonderful places like Potsdamer Platz, Kreuzburg, Gendermenmarkt, Brandenburg gate etc within walking distance. Yet it's in a quiet road and hence peaceful. Strongly recommended. Very noisy fan in the bathroom, which could not be turned off. Carpets in the room could be cleaner (but other than that, the room was very clean). Private parking is great, but 23 EUR seems quite much to me (with 'park at your own risk' sign). The shower doors were leaking. I was missing some cozy hotel lobby bar to drink my beer at (there is one just next to the reception, but definitely is not cozy - you sit at the bar counter). Great location, great breakfast (I was missing English breakfast, but other than that, it was great! ), 24/7 reception, modern and quiet. The hotel respected daytime saving change and stretched the breakfast hours (which are long enough even during normal operation). The checkout time is good. The bed was comfortable. Great location and friendly staff! Clean and comfortable. Being March the air conditioning was off yet the room was very hot and the window could be opened only slightly so we had no real control over the temperature of the room. Great location, very close to the City Centre and public transport. Good breakfast, welcoming and multilingual staff. The room was a bit warm for sleeping comfort. We changed the thermostat and opened the window, but remained warm.